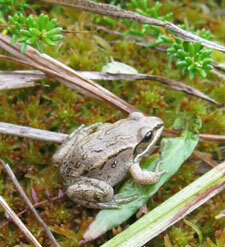 What is the Alaska Wood Frog Monitoring Project? The Alaska Wood Frog Monitoring Project is a volunteer based effort designed to assess the current status of Wood Frogs in Southcentral and Interior Alaska. The goal is to learn where they live, including their habitat types, and to establish a baseline for future monitoring. These projects are on-going and rely upon a network of volunteers consisting of individuals, families, community organizations, and school groups. We are looking for anyone who wants to learn more about amphibians and wetlands in South Central and Interior Alaska. This project provides a unique and fun opportunity to learn about amphibian ecology and to get outside and explore our wild Alaskan backyard – at the same time contributing valuable information to amphibian researchers in the state. In fact, without your help, we would not be able to collect this data to accomplish our research objectives.